assigns a quality estimate to each image, allows the user to select images based on the quality estimate, and finds the median. 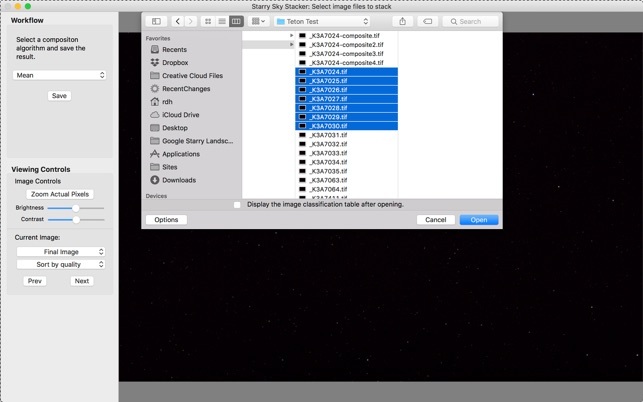 The resulting image has much less noise than any of the original images. Fixed an error that would cause a failure to align under certain combinations of lens focal length, sensor physical size and sensor pixel count. Failure was very likely with a telescope and a crop frame sensor. Added a check box at the bottom of the open panel that overrides any lens information in the EXIF data. This is useful to telescope users in two cases: you are using a smart phone or some other camera that always puts a focal length in the EXIF data with a telescope, you always use a telescope and are tired of typing "1000" into the pop-up dialog that asks for lens focal length. I am new to astrophotography and just started using an Ioptron Sky Guider Pro. Took a number of photos of M42 and stacked them in this program and was amazed how much noise was reduced and details enhanced. Very simple to use. Does not function as described, makes no improvement, takes a lot of time to do nothing. Could you contact me directly please? 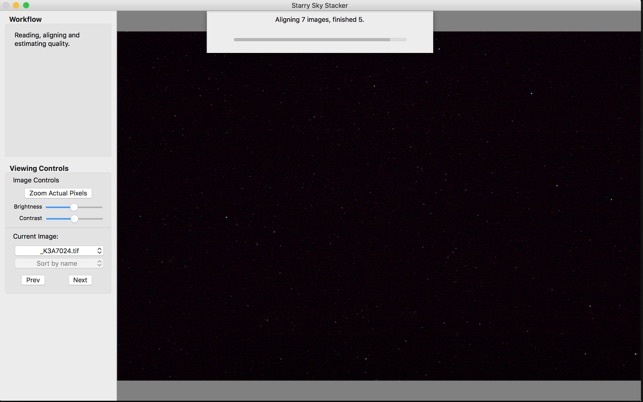 Launch Starry Sky Stacker and in the menu bar select "Help->Contact Developer". Starry Sky Stacker is working well for many people. I would like to find out why it is not working for you. This app does not work. Avoid it. Please tell me more. What happened when you tried the app? How did this differ from what you expected? Starry Sky Stacker is working well for a lot of people and I would like to make it work for you. Please send me mail--under the Help item in the menu bar select "Email Developer". Most email is answered in less than a day.